Druridge Bay is decked out in its high summer finery. The dunes in particular are an intense barrage of colour: the yellows of ragwort, bird’s foot trefoil and ladies' bedstraw in amongst a pink-purple haze of bloody cranesbill. The cranesbill is so abundant that it is easy to take for granted, covering very dune face and hollow, even scuffed tufts hanging over dune paths. 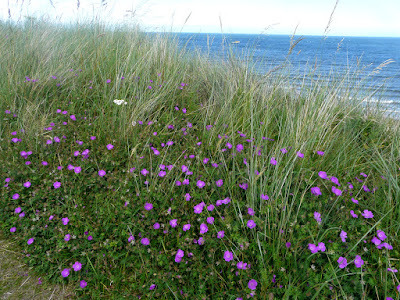 Try strolling out from Druridge Country park onto the dune-scape just beyond and the landward side of the tall dunes is a vivid sward of pink. They are wild geraniums, Geranium sanguinium. The odd sounding common name is not a botanist’s irate curse but a reference to their seed ponds that resemble miniature beaks of herons and storks and which become increasingly blood red in hue as summer advances, as if dipped in gore. You can make out a few of the pods, pointing skyward but still largely green in the photo above. 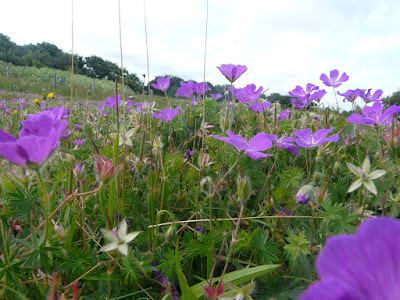 So abundant is the bloody cranesbill along the Northumberland coast that it would make a good icon of our summer coast. From Berwick upon Tweed down to Tynemouth this geranium is widespread. Elsewhere around the shores of the UK it is scarce. I don’t know why this should be. It seems a tough and successful plant, surviving our north sea ravaged winters and summer sea fret. Right now just take time to gaze out over the pink haze to the blue north sea, ideally with a colourful cobble bobbing in picturesque cliché just off shore. The North Sea sounds too cold a name for July. 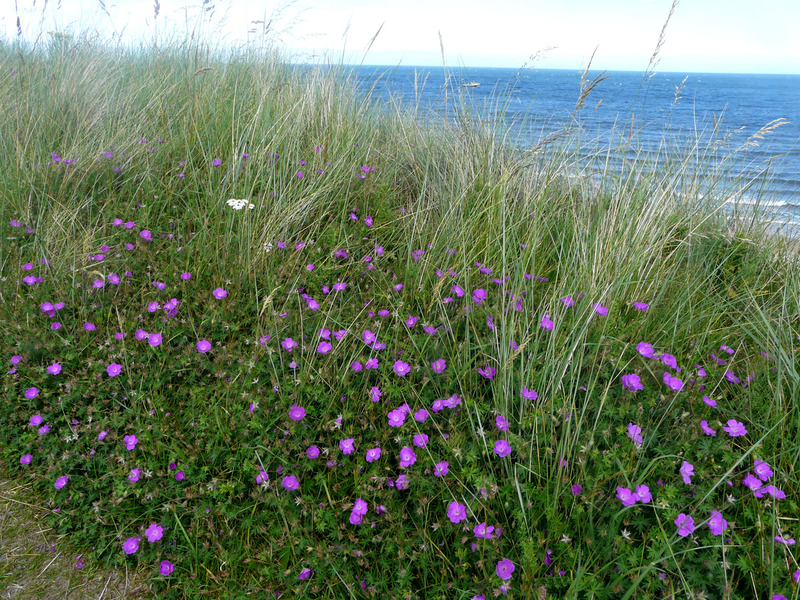 Even if only for a month the dunes bright hues make these northern shores a geranium sea.